Learn how to improve English listening skills with a lesson about building English fluency through subject mastery! In the sixth video in the series that will teach you how to improve English listening skills, I explain how to get fluent in English faster by mastering a few subjects rather than spending time trying to learn as much as possible, but only at a superficial level! It’s far better, when doing something like learning a language, or trying to develop any other skill, to focus on a single or limited set of topics you can go deep into. When you try to learn everything, you end up learning nothing. 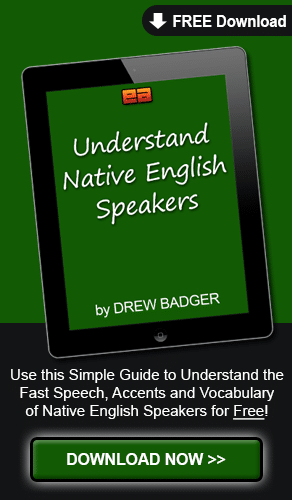 Enjoy this advanced English listening practice lesson video featuring me speaking at faster-than-native speed that will help you understand English speakers, and let us know what you think in the comments! Well, hello out there in YouTube land. It’s still kind of hot. But I thought for this advanced listening practice lesson I’d give you some interesting background to look at. uh, in a Japanese room and look out, and I get to see some lovely trees and a little bit of rain falling. So I hope you enjoy that as well. As always, this is our advanced listening practice, this new series. 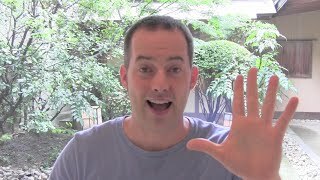 I will be speaking much more quickly than, uh, maybe you’re used or if you enjoy English lessons here on YouTube. so you can get used to my voice. or in just everyday conversations you’re having with people. So, if you’re understanding that, and you’re ready to go, let’s begin. Well, today I wanted to talk about something, uh, pretty interesting, actually. Uh, so, you know, I have a new baby. I had mentioned that in a previous video, if you’ve been watching these already. Thank you for all the congratulations and the well wishes, again. Uh, but this was actually something, uh, a few days ago. So I was, you know, just sitting at home and we had, uh, some visitors come over. Uh, these are two elderly women, uh, so they came over. Now, in Japan, since, you know, it’s a mixed baby, they call them half kids out here. You probably wouldn’t use that in America, but out here, you know, she’s known, Aria, my daughter, is known as a half baby. especially if they’ve never met one in person before. Anyway, so we had these two, uh, elderly women come over. uh, in her, I think maybe next week or next month she’ll be turning 90 years old. uh, and so is the, uh, the older one, uh, or so does the older one, I should say. so, you know, she has a cane, and we try to help her move, but, so, anyway. They came to the house, they relaxed with us for a little bit, got to see the baby, and hold the baby a little bit. So they really enjoyed that. or I didn’t go home but, you know, I was going out for the day. I was going out to do some errands or something like that after they left. the one that’s about to be 90 years old. uh, just the story a little bit. But so anyway, so we’re going to the, uh, the train station, and we’re walking downstairs, and everything is taking a lot longer. and walking really, really slowly as we go to the train station. and then we’re talking on the train about different things. About how she had like, uh, an open heart surgery. so she’s still doing very well. And she’ll get into the pool, and do some walking, and things like that. I actually held her hand as we walked all the way to her house. Now, if I’m walking by myself it would probably take me maybe two minutes to get where she lives, but it took us about 20. And she was still winded. like you’re doing a lot of running or exercising, and then, heh, heh, heh. Then you get tired like that, so you’re feeling winded. uh, and I move through the, through the city pretty quickly. I like to walk around, and it’s, uh, nice and relaxing for me. Instead of taking a tram or a bus around the city I’ll just walk from different places. uh, you know, get a little bit of extra workout like that, like working on a, uh, a treadmill that’s going up, like that. So, anyway, I’m walking with her, and instead of what I normally do, walking really quickly I’m really, really walking slowly. And this isn’t even normally, like just slow walking like I’m in a museum looking around. uh, more slowly than that. But I really appreciated the chance to do that. but walking with her I’m kind of talking with her, and I’m noticing all these little shops and things like that that I wouldn’t notice normally. Now, you’ll probably get a good feeling for this if you maybe take a car, or you take a train, or something like that. or you’re getting to the location you want to be, uh, at faster. I’m getting there faster than by walking. But what you sacrifice is not being able to notice a lot of the things very quickly. uh, of what I wanted to talk about today, and something that’s very important and really part of the way that I teach and try to help students learn. And this is about how you can really begin to focus by deciding on what your real objective is. 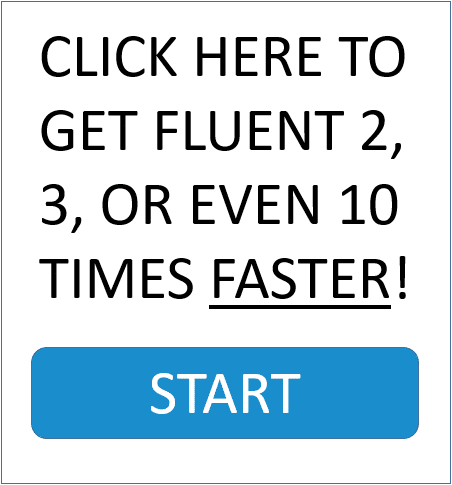 A lot of people want to get to fluency quickly, and, you know, we really try to help people get there as quickly as possible. But really, one of the best ways to get there quickly is to get there slowly. those are the things that, you know, really are going to help you get fluent. uh, the speed at which I’m walking. uh, and some new things that happened, and other things like that, and where she lived. It was only like two or three blocks that we walked. and then we just walked up two streets and walked over another street, crossed a river, and that was her home. So it was actually a really quick walk, but within all of these spaces all of these different things were happening. you didn’t really noticed those things. It’s not the same way you would, you would think about that. You’d maybe, you just don’t care, it’s not so important to you. like a video lesson from me or somebody else, you get really excited, you want to watch the whole thing, and that’s what you do. What I would really encourage you to do is to take time with things like that. Let’s say I make, you know, even this video. I have some videos that are longer than this, maybe 30 minutes long. But you don’t have to watch the whole thing. and really try writing it, or reading it, or you could try speaking along with me as I speak. really the fluency is the journey. Now, I know this is kind of a cliché. you know, it’s just not, you know, something worth saying. and I think it’s something that a lot of people forget. all of these little things that you’ve learned, like even just, you know, sitting around in this, uh, this room right here. or other things like that. we can really dive into a particular thing. Uh, and what you should be using for that is something you’re really interested in. and I want to share that with you a little bit and, you know, get you involved in the atmosphere. And part of the reason I came to Japan was because of this. Actually, the main reason I came to Japan was because of what you see behind me. that taller one, uh, of these couple of bushes here, but that’s one of my favorite trees. rain, uh, just, just covering the leaves a little bit. to getting, it is, you know, whatever the, the particular thing you’re after, but especially fluency. you know, not just, not just slowly but extra slowly. It, it kind of felt uncomfortable for me. but it doesn’t necessarily mean it’s bad. so it’s easy to do what’s comfortable, what’s every day, and all these other things. and try to do something new and different, it’s going to feel uncomfortable, but it’s probably going to be worth it for you as well. So I highly recommend you do that. is stop and smell the roses. So take time to stop and smell the roses. So take a moment to enjoy that. Not be so hurried and trying to do things quickly all the time. If you look at people, the people that get fluent are the ones that steadily improve a little bit each month. And this is exactly why we teach people how to do this in Master English Conversation. and let you maybe do two or three phrases a day that you can learn, and then that’s what’s really going to help you get fluent. you come at that information from a lot of different angles. and then you build on that each month. And that’s why Master English Conversation members really enjoy the program. so that way they won’t have to study things over and over again. uh, to join the program, if you’re not already a member. If you’d like to learn more about Master English Conversation, you can also click on the link in this video or in the description below this video. But whether you learn with me or not, it doesn’t matter. all of these things, and a lot of that is going to come from stopping and smelling the roses. Well, that’s it for this, uh, advanced listening practice lesson. I look forward to seeing you next time, as soon as this gets to 100 million views. All right, we’ll just make it easy, we’ll just say 10,000 views again. but, uh, you know, if it gets 100 million views maybe I’ll do something even crazier. Anyway, I look forward to seeing you in the next lesson video.